Mrs. Thompson showing former level of sand (prior to fortnight ago). 98-99, etc. 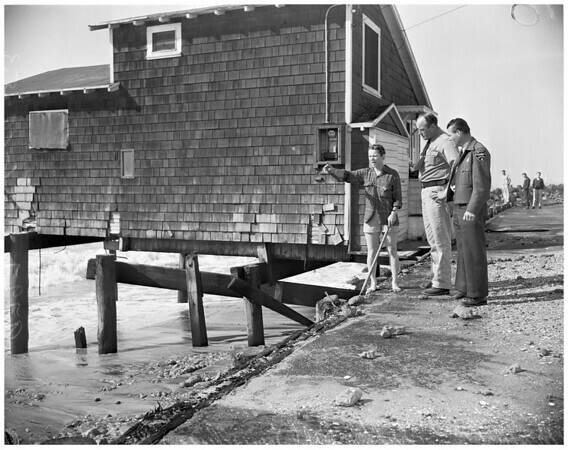 : Mrs. Melba Schultz, of 115B Surfside, last 'survivor' of whole neighborhood of sea-battered homes, takes look at 'house on stilts' at 116A Surfside, where piling foundations have been exposed and torn out. Mrs. Schultz showing Fish & Game Wardens l to r: Robt. Terwilliger and Robt. Mason, on inspection trip, where surf reduced sand level from even with roadway. Earl L. Johnson home, 116A Surfside, teetering on stilts, only few of which remain after ocean ravages."